Kyo: Hehehe...How ironic...Who would have thought that my best friend would be the one to end me. This is a scene where Hiryu(OC) had to kill his childhood friend Kyo(OC), but what happened? Why are those two fighting? Weeeell I want YOU to comment on that by just reading the dialog above and having a good look at the picture(make up a good story), give me your thoughts, what could have happened between them that lead those two into a death fight. Any creative comment will be appreciated. Maybe it happened to be that not so long ago Kyo had been in love with a woman named Reeko and she had been in love with Kyo as well. Kyo, Reeko and Hiryu use to hang out all the time together...until Kyo got called off to war. Before going off to wat, Kyo had asked Hiryu to take care of Reeko for him while he was away and to promise to always keep her safe. Hiryu being the good friend that he was agreed to this and so Kyo went off to war. During the time that Kyo was away, Hiryu and Reeko began to grow closer to each other and soon love had bloomed between them. Both Hiryu and Reeko felt terrible about this because they felt that they were betraying Kyo, but alas they could not hold back their feeling for each other. Well, many months passed and soon Kyo had returned from war and found out that Hiryu and Reeko had fallen in love. Naturally he felt betrayed by both of them and had lost contact with them for some time. Well time had passed and Reeko had ended up getting very sick. She had an incurable disease and died. A funeral was held for her and it was then that Kyo had showed his face again after so long. It was also then that he challenged Hiryu to a battle for betraying him and told him to meet at sunset on top of Mt. Haya (just made that up...haha) 3 days after the funeral. Hiryu didn't want to fight the one whom he still considered to be his friend, but Kyo had threatened to kill Hiryu's whole family if he didn't. So, Hiryu had no choice but to accept the challenge and did indeed meet Kyo on the top of Mt. Haya 3 days later. Well, the duked it out and swords were clashing and angry was flowing through them and words were exchange between the two men. 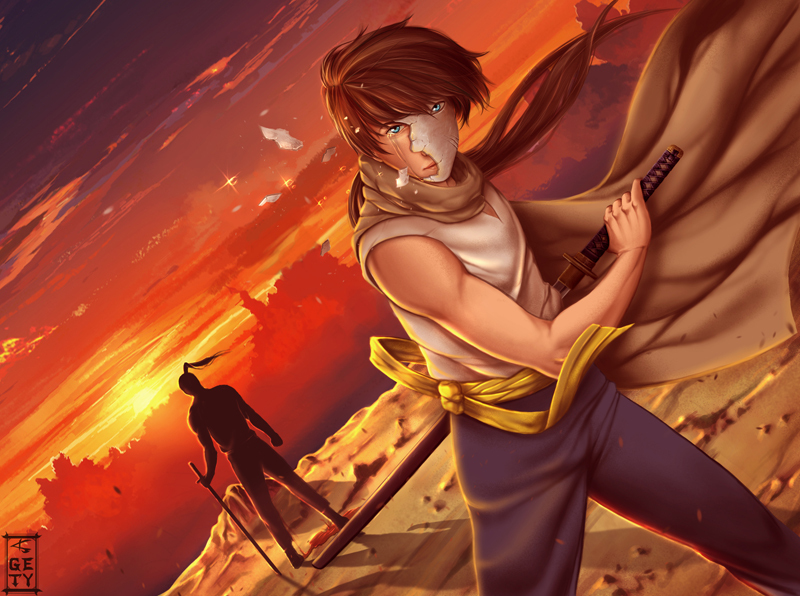 Until at last Hiryu had Kyo knocked down to his knees and it was then that Kyo had asked Hiryu to finish him. But Hiryu didn't want to kill his best friend whom he'd know his whole life and tried to tell Kyo that he was sorry and he didn't mean to hurt Kyo. Kyo became furious by this and rose to his feet and tried to stab Hiryu in the heart. In self defense, Hiryu swifty moved and sliced his friend. Kyo fell to the ground, twitched a few times and then died. Hiryu was devastated as he looked at the lifeless body of his friend and said "Rest in peace...Brother." Meh...it was the best I could come up with for a spur of the moment story...haha. Amazing what you came up with! I love how you created another character and made the story more believable by adding the name of the mountain, thank you very much for your awesome story, you are amazing! I'm actually glad that the blood is subtle due to the red sky. It really makes you take time to look at the picture. The idea of having a dialog with these characters is very creative. It is like it is Kenshion again! ohh wow this is fantastic! as for why...well...for one i see in the keywords Ninja and Samurai...well back in Feudal Japan, the samurai where seen by many as abusing thair power and status...the Ninja of Japan was brought thier and used specifically against the samurai...the Ninja though where also shrouded in mystery and many villagers thought of them as demons..the way they could disappear at will...because of this many people dident like the Ninja at all....who is to say whitch one is good and which was evil? but what i see is a classic death match between Ninja and samurai...made even more emotional and intense by the fact that Hiryu who i am assuming might be a ninja had to kill Kyo who i am assuming is a Samurai because Kyo was serving an evil Feudal lord...and probably ordered to do many things some would be considered as wicked....but thier is no lost love between them as Kyo what doing what is demanded of him...because it is a samurai's duty to serve his master....reguardless of how good or how wicked his master is...you do not question orders, only carry them out...Kyo was doing what he believed was right and honorable and Hiryu was doing what HE believed was Right and honorable and killed his brother/best friend to end his service to the evil Feudal lord.....who is to say who was right or wrong in this decision? Amazing how you could tell that Hiryu is a ninja and Kyo a samurai just by looking at the tags, and I really love your story! Thank you very much for commenting! That's just what I thought of anyway ^^ I really like the background in this picture, very pretty and detailed! Awesome story telling there! I just love to see with what stories people come up just by looking at my pic, It's so exciting! Thank you very much for commenting.